When I called Susan Hayes to talk to her about her new, affordable, “green” house in Williston, Vermont, one of the first things she said was, “We really wanted to respect the local vernacular…” She and her husband Ryan created what they call a “Modern Farmhouse”. 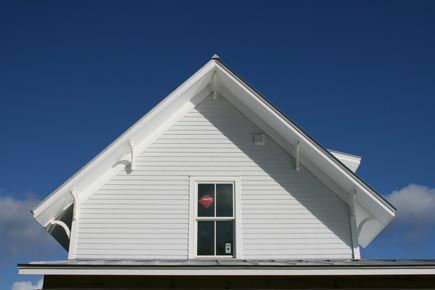 The exterior was inspired by the farmhouse Ryan’s dairy-farming great grandparents’ owned, and “the inside is really sparse which is more of a Modern feel,” explains Susan. Their hybrid aesthetic is unusual for a “green” home. The fact that it’s smaller is a “green” hallmark. 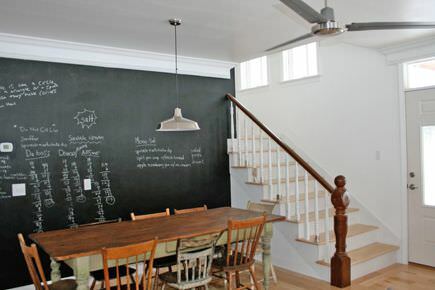 I found Susan and Ryan through their blog Building Green in Vermont in which they have documented their home’s “green” evolution. “We really weren’t that enlightened when we started,” admits Susan. But thanks, in part, to a lengthy local permitting process, they had time to research and educate themselves in efficient and sustainable design. Susan discovered that “size is absolutely critical.” After estimates for an initial design proved too expensive, she and Ryan realized they would need to downsize to keep the construction of their first house on budget and “green”. They scrapped plans for a 2200 sq. 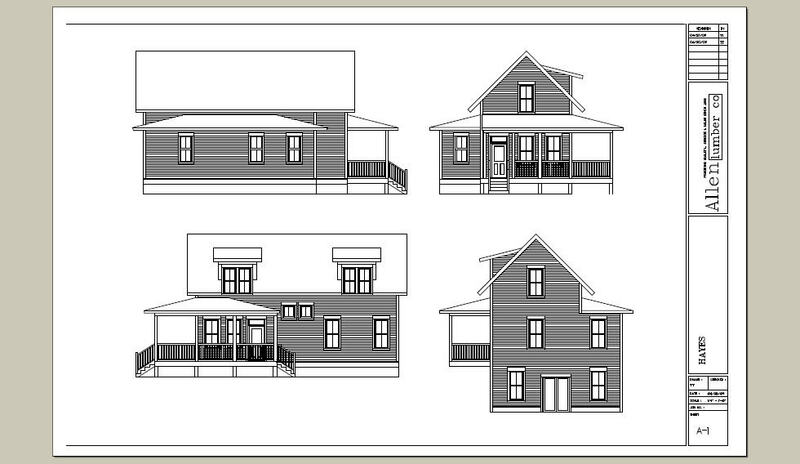 ft house (not including a finished, walk-out basement) for a 1568 sq. ft house (not including a finished, walk-out basement). The initial larger scheme had been created by a drafting service under Susan and Ryan’s direction. The smaller scheme, which they built, was based on an architectural design they found online by an architect in South Carolina. “I’m a big fan of Sarah Susanka. When you’re designing small, I think you really need an architect,” notes Susan. “What the architecturally designed plan did for us was create a more thoughtful house,” she concludes. Reducing approximately 630 sq. ft. from the first and second floors ultimately brought the house’s construction costs down to around $235,000. That figure doesn’t include the land, which had been in Ryan’s family, or the site work and consultants’ fees. Also, Susan and Ryan may have saved money by handling the bulk of the general contracting themselves prior to breaking ground. Once construction began, they happily handed much of the general contracting responsibility over to Bill Litchfield of Specialty Design. The interior, however, did not suffer as a result. 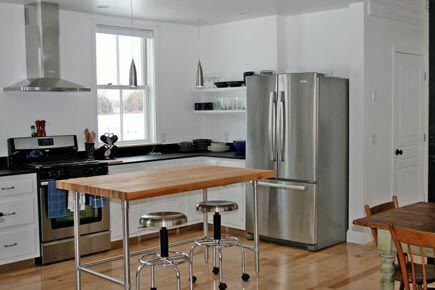 The primary living spaces are clean, mostly white with sustainably harvested maple floors from a nearby Canadian supplier. Susan and Ryan splurged on zero V.O.C. 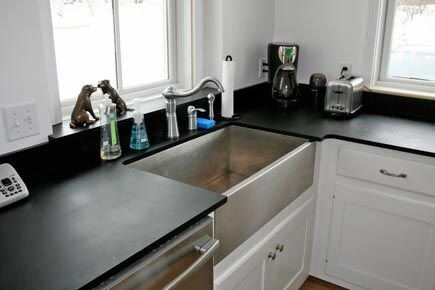 paint, custom kitchen cabinetry, solid-surface counters made with 100% post-consumer recycled paper, and stainless steel Energy Star-qualified kitchen appliances. When funds allow, they may swap out the porcelain ceramic tile at the entry with large slate tiles. Other features, like the black-board paint on the dining area wall, hexagonal floor tile and subway wall tile in the bathrooms, as well as reclaimed bathroom sinks add character relatively inexpensively. 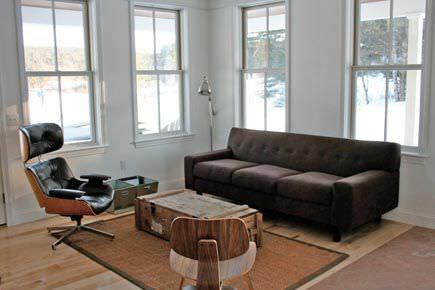 Over time, they expect to add punches of interior color in keeping with their taste for Scandinavian design. Susan and Ryan learned about “green” building with the aid of consultants and resources like Efficiency Vermont (a nonprofit provider of energy efficiency services in Vermont) and by taking it upon themselves to explore “green” design in magazines, museums, at conferences, and online, especially through blogs. They found two blogs particularly influential, the 100K House and From the Ground Up. “Reading blogs was absolutely ideal. That’s why we started ours because I learned so much from other people that were going through the process,” says Susan. “The blog became my virtual binder…It was a really nice way for me to catalog the research…” she continues. With their home’s construction mostly behind them, Susan and Ryan have a new adventure on the horizon. They’re expecting their first child in February. Though their attention is likely to stray from “green” building for a time, come spring they hope to cultivate an edible landscape which they intend to water with rain collected in barrels from the roof. They started last fall by planting an orchard of Macintosh, Liberty, and Sweet Sixteen apple trees, and they plan to add raspberry and blueberry bushes elsewhere. According to Susan, “I really like long-term projects.” If you’re building “green”, a long-term mindset certainly helps. Katie Hutchison is an architect, design writer, and fine-art photographer in Salem, Massachusetts. She owns Katie Hutchison Studio and produces House Enthusiast, an on-line magazine exploring house, garden, and related creative arts in New England. Katie is developing some predesigned houses that will accommodate today’s full lives in smaller, high-performance homes inspired by vernacular simplicity. Photos and drawings provided by Susan and Ryan Hayes. It looks really cool. I like the country feel, but modern. I don’t see how this is green or small. That house is a monster. They used some green technology, but it doesn’t make it a green house. Thanks for your thoughts J. Many of the builders that we talk to indicate that the choices that Susan and Ryan made (ICFs (Insulated Concrete Forms) for the basement, SIPs (Structurally Insulated Panels) for the exterior walls, closed-cell blown-in insulation for the truss roof, fiberglass windows, fiber cement lap siding, a propane-fired radiant heating system, an HRV (Heat Recovery Ventilator), and standing-seam metal roofing plus future plans to install solar panels on the property to incorporate into the heating and/or domestic hot water systems) would make the green cut. 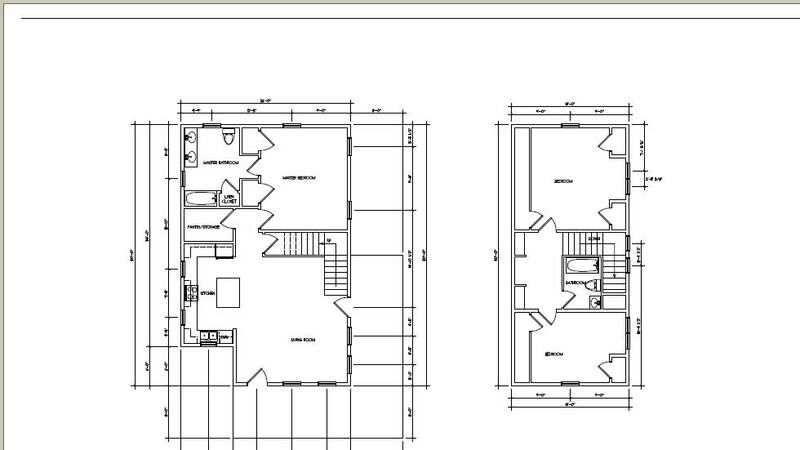 The house is larger than most houses we feature but is also smaller than most houses being made in North America. For whatever it is worth we did put the word green in parenthesis. It seems like the standards haven’t been written on that word yet. In other words, the jury is still out. What is your definition of green and small? Your right, it does make the green cut. Sometimes I get a little blinded by radical views. I always imagine a green house revolution as something completely different from our tradition view of housing. We will always have to make sacrifices in the structures we build if we don’t want to go back to living in tents and in caves. The house is smaller than most being built these days. You did say in your article that 1500sqft does not include the finished basement that I would estimate to be another 500sqft at least. I haven’t read their blog yet, but I’ll get to it. My idea of a small house is 1000 sqft or under, but maybe I have a tiny house in mind. I currently comfortably live in 900sqft. I could stand to get rid of some furniture, and live in less. I’d actually prefer it, but I have to compromise with the wife. If nothing more the house is a great inspiration for features to include in a smaller house. 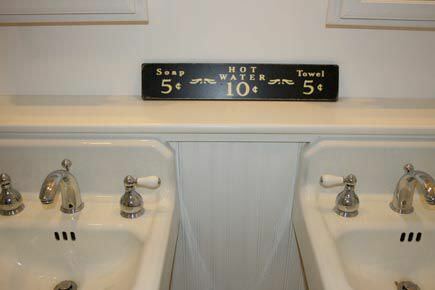 I collect pictures of features I like in houses, and I will be saving a few from this one. Thanks for your thoughtful response J. I think you are right, we all need to bend our minds a little bit. I tend towards the radical as well but we bent the “rules” on this post (and categorized it in our “not so small” section. 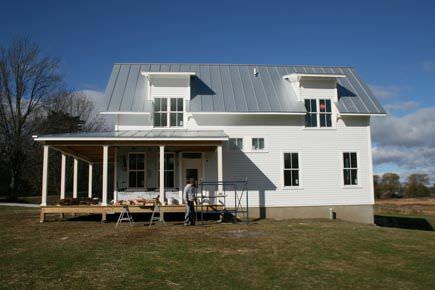 And you are absolutely right, the house is a great inspiration for smaller house construction. Some people need or want more space than others and at different times of their lives as well. I think tolerance is the lesson here. I’m often quick to jump and make assumptions b/c I see a snapshot of somebody’s life. It is often not the whole story. Glad you like the images! Congrats on the completion of a fine project. I’m glad our site could offer some inspiration. 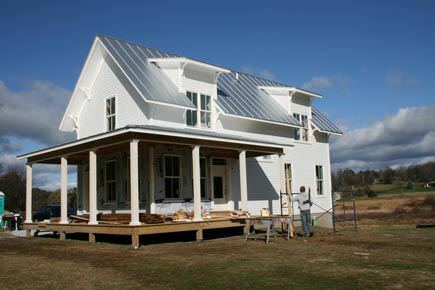 It’s nice to see some elements like the standing seam metal and ICF’s that we considered but had to eliminate due to budget. It’s also encouraging to see a project stick to its guns on the envelope and not sacrifice long-term efficiency for the sake of interior finishes that could be replaced within 5 years. Lastly, I’m curious if pellet boilers were ever considered to power the radiant heating? As someone who is starting to investigate this concept, it would be great to hear your thoughts on them. The state of Vermont is unfortunately one of the most expensive states to build a house, $235,000 plus land cost is an insanely good deal for a 2,000sq ft house that is environmentally friendly. Which is why nobody in Vermont can afford to build a house here anymore.